Important: A malicious entity could forge an AIR file with your identity if it somehow obtains your signing keystore file or discovers your private key. When an AIR file is signed, a digital signature is included in the installation file. The signature includes a digest of the package, which is used to verify that the AIR file has not been altered since it was signed, and it includes information about the signing certificate, which is used to verify the publisher identity. AIR uses the public key infrastructure (PKI) supported through the operating system’s certificate store to establish whether a certificate can be trusted. The computer on which an AIR application is installed must either directly trust the certificate used to sign the AIR application, or it must trust a chain of certificates linking the certificate to a trusted certification authority in order for the publisher information to be verified. If an AIR file is signed with a certificate that does not chain to one of the trusted root certificates (and normally this includes all self-signed certificates), then the publisher information cannot be verified. While AIR can determine that the AIR package has not been altered since it was signed, there is no way to know who actually created and signed the file. Note: A user can choose to trust a self-signed certificate and then any AIR applications signed with the certificate displays the value of the common name field in the certificate as the publisher name. AIR does not provide any means for a user to designate a certificate as trusted. The certificate (not including the private key) must be provided to the user separately and the user must use one of the mechanisms provided by the operating system or an appropriate tool to import the certificate into the proper location in system certificate store. Important: As of AIR 1.5.3 the publisher ID is deprecated and no longer computed based on the code signing certificate. New applications do not need and should not use a publisher ID. When updating existing applications, you must specify the original publisher ID in the application descriptor file. Prior to AIR 1.5.3, the AIR application installer generated a publisher ID during the installation of an AIR file. This was an identifier that is unique to the certificate used to sign the AIR file. If you reused the same certificate for multiple AIR applications, they received the same publisher ID. Signing an application update with a different certificate and sometimes even a renewed instance of the original certificate changed the publisher ID. In AIR 1.5.3 and later, a publisher ID is not assigned by AIR. An application published with AIR 1.5.3 can specify a publisher ID string in the application descriptor. You should only specify a publisher ID when publishing updates for applications originally published for versions of AIR prior to 1.5.3. If you do not specifying the original ID in the application descriptor then the new AIR package is not treated as an update of the existing application. To determine the original publisher ID, find the publisherid file in the META-INF/AIR subdirectory where the original application is installed. The string within this file is the publisher ID. Your application descriptor must specify the AIR 1.5.3 runtime (or later) in the namespace declaration of the application descriptor file in order to specify the publisher ID manually. When a publisher ID changes, the behavior of any AIR features relying on the ID also changes. For example, data in the existing encrypted local store can no longer be accessed and any Flash or AIR instances that create a local connection to the application must use the new ID in the connection string. The publisher ID for an installed application cannot change in AIR 1.5.3 or later. If you use a different publisher ID when publishing an AIR package, the installer treats the new package as a different application rather than as an update. The AIR signing tools accept any keystores accessible through the Java Cryptography Architecture (JCA). This includes file-based keystores such as PKCS12-format files (which typically use a .pfx or .p12 file extension), Java .keystore files, PKCS11 hardware keystores, and the system keystores. The keystore formats that ADT can access depend on the version and configuration of the Java runtime used to run ADT. Accessing some types of keystore, such as PKCS11 hardware tokens, may require the installation and configuration of additional software drivers and JCA plug-ins. Note: The certificate must be created for code signing. You cannot use an SSL or other type of certificate to sign AIR files. When you sign an AIR file, the packaging tool queries the server of a timestamp authority to obtain an independently verifiable date and time of signing. The time stamp obtained is embedded in the AIR file. As long as the signing certificate is valid at the time of signing, the AIR file can be installed, even after the certificate has expired. On the other hand, if no time stamp is obtained, the AIR file ceases to be installable when the certificate expires or is revoked. By default, the AIR packaging tools obtain a time stamp. However, to allow applications to be packaged when the time-stamp service is unavailable, you can turn time stamping off. Adobe recommends that all publicly distributed AIR files include a time stamp. The default time-stamp authority used by the AIR packaging tools is Geotrust. To obtain a certificate, you would normally visit the certification authority web site and complete the company’s procurement process. The tools used to produce the keystore file needed by the AIR tools depend on the type of certificate purchased, how the certificate is stored on the receiving computer, and, in some cases, the browser used to obtain the certificate. For example, to obtain and export an Adobe Developer certificate certificate from Thawte you must use Mozilla Firefox. The certificate can then be exported as a .p12 or .pfx file directly from the Firefox user interface. Note: Java versions 1.5 and above do not accept high-ASCII characters in passwords used to protect PKCS12 certificate files. Java is used by the AIR development tools to create the signed AIR packages. When you export the certificate as a .p12 or .pfx file, use only regular ASCII characters in the password. You can generate a self-signed certificate using the Air Development Tool (ADT) used to package AIR installation files. Some third-party tools can also be used. For instructions on how to generate a self-signed certificate, as well as instructions on signing an AIR file, see AIR Developer Tool (ADT). You can also export and sign AIR files using Flash Builder, Dreamweaver, and the AIR update for Flash. The following example describes how to obtain an AIR Developer Certificate from the Thawte Certification Authority and prepare it for use with ADT. Note: This example illustrates only one of the many ways to obtain and prepare a code signing certificate for use. Each certification authority has its own policies and procedures. Visit the Thawte web site and navigate to the Product page for Code Signing Certificates. From the list of Code Signing Certificates, select the Adobe AIR Developer Certificate. Complete the three step enrollment process. You need to provide organizational and contact information. Thawte then performs its identity verification process and may request additional information. After verification is complete, Thawte will send you e-mail with instructions on how to retrieve the certificate. Retrieve the issued certificate from the Thawte site. The certificate is automatically saved to the Firefox keystore. Select the Adobe AIR Code Signing Certificate from the list of certificates and click the Backup button. Enter a file name and the location to which to export the keystore file and click Save. On the Choose a Certificate Backup Password dialog box, create a password for the keystore file. Important: This password protects the keystore file and is required when the file is used for signing AIR applications.A secure password should be chosen. Use the exported keystore file with ADT, Flash Builder, Flash Professional, or Dreamweaver. The password created for the file is required whenever an AIR application is signed. Renewing the original signing certificate. For AIR to recognize an AIR file as an update, you must either sign both the original and update AIR files with the same certificate or apply a certificate migration signature to the update. A migration signature is a second signature applied to the update AIR package using the original certificate. The migration signature uses the original certificate to establish that the signer is the original publisher of the application. After an AIR file with a migration signature is installed, the new certificate becomes the primary certificate. Subsequent updates do not require a migration signature. However, you should apply migration signatures for as long as possible to accommodate users who skip updates. Important: You must change the certificate and apply a migration signature to the update with the original certificate before it expires. Otherwise, users must uninstall their existing version of your application before installing a new version. For AIR 1.5.3 or later, you can apply a migration signature using an expired certificate within a grace period of 365 days after it expires. 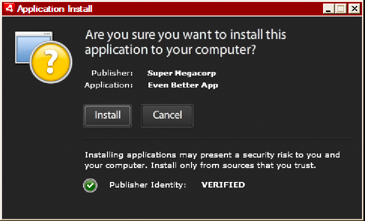 However, you cannot use the expired certificate to apply the main application signature. An AIR file with a migration signature is, in other respects, a normal AIR file. If the application is installed on a system without the original version, AIR installs the new version in the usual manner. Note: Prior to AIR 1.5.3, signing an AIR application with a renewed certificate did not always require a migration signature. Starting with AIR 1.5.3, a migration signature is always required for renewed certificates. To apply a migration signature use the ADT migrate command, as described in Signing an updated version of an AIR application. The new application version cannot access data in the existing encrypted local store. The location of the application storage directory changes. Data in the old location is not copied to the new directory. (But the new application can locate the original directory based on the old publisher ID). The application can no longer open local connections using the old publisher ID. The identity string used to access an application from a web page changes. When publishing an update with AIR 1.5.3 or later, the application identity cannot change. 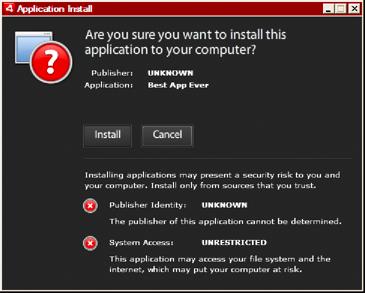 The original application and publisher IDs must be specified in the application descriptor of the update AIR file. Otherwise, the new package is not recognized as an update. Note: When publishing a new AIR application with AIR 1.5.3 or later, you should not specify a publisher ID. This section provides a glossary of some of the key terminology you should understand when making decisions about how to sign your application for public distribution. An entity in a public-key infrastructure network that serves as a trusted third party and ultimately certifies the identity of the owner of a public key. A CA normally issues digital certificates, signed by its own private key, to attest that it has verified the identity of the certificate holder. Sets forth the practices and policies of the certification authority in issuing and verifying certificates. The CPS is part of the contract between the CA and its subscribers and relying parties. It also outlines the policies for identity verification and the level of assurances offered by the certificates they provide. A list of issued certificates that have been revoked and should no longer be relied upon. AIR checks the CRL at the time an AIR application is signed, and, if no timestamp is present, again when the application is installed. A certificate chain is a sequence of certificates in which each certificate in the chain has been signed by the next certificate. A digital document that contains information about the identity of the owner, the owner’s public key, and the identity of the certificate itself. A certificate issued by a certification authority is itself signed by a certificate belonging to the issuing CA. An encrypted message or digest that can only be decrypted with the public key half of a public-private key pair. In a PKI, a digital signature contains one or more digital certificates that are ultimately traceable to the certification authority. A digital signature can be used to validate that a message (or computer file) has not been altered since it was signed (within the limits of assurance provided by the cryptographic algorithm used), and, assuming one trusts the issuing certification authority, the identity of the signer. A database containing digital certificates and, in some cases, the related private keys. An extensible architecture for managing and accessing keystores. See the Java Cryptography Architecture Reference Guide for more information. The Cryptographic Token Interface Standard by RSA Laboratories. A hardware token based keystore. The Personal Information Exchange Syntax Standard by RSA Laboratories. A file-based keystore typically containing a private key and its associated digital certificate. The private half of a two-part, public-private key asymmetric cryptography system. The private key must be kept secret and should never be transmitted over a network. Digitally signed messages are encrypted with the private key by the signer. The public half of a two-part, public-private key asymmetric cryptography system. The public key is openly available and is used to decrypt messages encrypted with the private key. A system of trust in which certification authorities attest to the identity of the owners of public keys. Clients of the network rely on the digital certificates issued by a trusted CA to verify the identity of the signer of a digital message (or file). A digitally signed datum containing the date and time an event occurred. ADT can include a time stamp from an RFC 3161 compliant time server in an AIR package. When present, AIR uses the time stamp to establish the validity of a certificate at the time of signing. This allows an AIR application to be installed after its signing certificate has expired. An authority that issues time stamps. To be recognized by AIR, the time stamp must conform to RFC 3161 and the time stamp signature must chain to a trusted root certificate on the installation machine. The code signing certificates issued by Apple are used for signing iOS applications, including those developed with Adobe AIR. Applying a signature using a Apple development certificate is required to install an application on test devices. Applying a signature using a distribution certificate is required to distribute the finished application. To sign an application, ADT requires access to both the code signing certificate and the associated private key. The certificate file, itself, does not include the private key. You must create a keystore in the form of a Personal Information Exchange file (.p12 or .pfx) that contains both the certificate and the private key. See Converting a developer certificate into a P12 keystore file. To obtain a developer certificate, you generate a certificate signing request, which you submit at the Apple iOS Provisioning Portal. The certificate signing request process generates a public-private key pair. The private key remains on your computer. You send the signing request containing the public key and your identifying information to Apple, who is acting in the role of a Certificate Authority. Apple signs your certificate with their own World Wide Developer Relations certificate. On Mac OS, you can use the Keychain Access application to generate a code signing request. The Keychain Access application is in the Utilities subdirectory of the Applications directory. Instructions for generating the certificate signing request are available at the Apple iOS Provisioning Portal. Open a Windows command session, and CD to the OpenSSL bin directory (such as c:\OpenSSL\bin\). openssl req -new -key mykey.key -out CertificateSigningRequest.certSigningRequest  -subj "/emailAddress=yourAddress@example.com, CN=John Doe, C=US"
To create a P12 keystore, you must combine your Apple developer certificate and the associated private key in a single file. The process for creating the keystore file depends on the method that you used to generate the original certificate signing request and where the private key is stored. Command-click the iPhone Developer certificate and select, Export “iPhone Developer: Name...”. Save your keystore in the Personal Information Exchange (.p12) file format. You will be prompted to create a password that is used when you use the keystore to sign applications or transfer the key and certificate in this keystore to another keystore. To develop AIR for iOS applications, you must use a P12 certificate file. You generate this certificate based on the Apple iPhone developer certificate file you receive from Apple. If you are using a key from the Mac OS keychain, use the PEM version you generated in the previous step. Otherwise, use the OpenSSL key you generated earlier (on Windows).